How to split a video ? 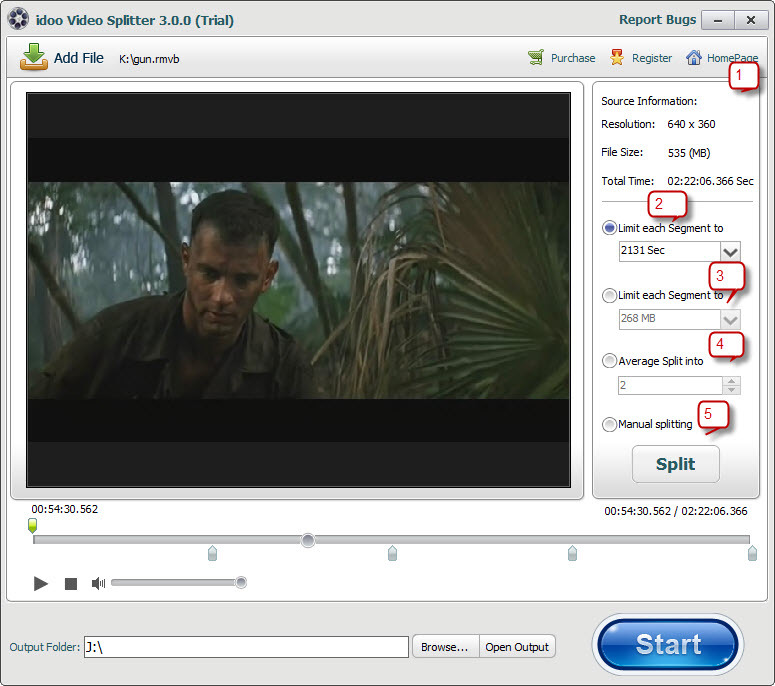 Follow the guides to know more about how to split video to any video formats, such as AVI, MP4, WMV, FLV, MKV, MPEG, H264, iPhone, iPad, Samsung, Android, Google phone. Import video on your hard drive or USB in the program by click “add file” button. You will see following program interface. 1.The original video information, including Resolution, File size and Total time. 2.Limit each segment to seconds, CD duration, DVD duration or manual enter the time. 3.Limit each segment to size in MB or manual enter the size. 4.Average split video to several segments. 5.Manual splitting mode to make the segments more useful. Preview the video and take a screen shot is also available. Please remember to click "split" button after you splitting. Finally select an output video format like iPhone, iPad, MP4, AVI, and click “Start” button, after a few minutes, you will have a video of your own slit.